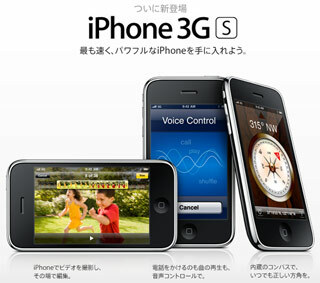 Plenty of news today considering the recent announcement from Apple, the iPhone 3GS will hit here June 26th, so we thought it would be worthwhile to review where things stand to-date for Steves Amazing Device in Japan. Since both Apple and SoftBank Mobile have always refused to disclose unit sales, even targets for that matter, it has naturally been an ongoing obsession for many – how is the iPhone doing in Japan? There are several angles to approach this on so for starters lets just say that, while there seems to be recent awakening and therefore increased adoption, expectation often leads to disappointment. As the 1st year anniversary since launch here last July is fast approaching we have assembled our most candid and personal observations, for WWJ Subscribers, after the jump. The folks at SBM continue to insist that sales are good, which is supported by recent un-official results from GfK, but it’s tricky math to come up with a forecast of devices sold on the basis of domestic app store sales considering the popularity of pre-established and non-carrier specific iTouch units. So, to the nut, have they moved 1 Million units – not likely. The iPhone for Everyone campaign, launched in February, was seen as a panic signal to move product – with some success according to the chart below – before the new model hits the street here end of June. In effect with some price bundle tweaks, as flat-rate data plans have been iPhone requirement since day one, new users could sign-up for a two-year contract and get the 8GB model ‘essentially’ for free. As a side note, it’s interesting we didn’t hear much chatter about how that seems to be at odds with the recent non-subsidy rules imposed on all operators last year. With less than 1% of market share, consider Nokia was performing better and still exited, it’s a small wonder this even makes for a blip on the radar. However, although the average Japanese iPhone owner is using it as a second device, and adoption by the female segment remains – shall we say – elusive, there are some bright spots to balance the story. While the on-deck approach of managed contents and services in Japan goes back 10-years with the launch of i-mode, actually we should point-out that then J-Phone beat DoCoMo to the punch with their J-Sky offering by a few months, the folks at Apple have managed to carve new turf in this space as a non-telco with everyone else now playing catch-up. The angle represents an international mobile eco-system that the other ODM’s are finally starting to wake-up too. Several notable thoughts for the local, and ultimately global, evolution of this platform stand out. Even though a 70/30 revenue share (vs. the standard 90/10 split here) is ‘somewhat’ less attractive, local talent quickly realized they could tap into nearly 40 Million customers worldwide – and growing – all on basically the same handset specs.. nice. Also, their time to market for official approval and launch on the app store has generally been about 1-week vs. a month or more, plus predictable required changes, for deployment on domestic platforms.. very nice. Ultimately, since many local players have had challenges in the past to port their existing offerings into other regions, the App Store has fast-tracked them through what has often been best described as a painful and confusing maze of dead-ends, to quote MasterCard.. priceless. Now with a second generation handset on the near horizon, as mentioned from the very beginning in Jan. 2006, we should start to see – just like the continued improvements on iPod – an even more polished offering. Finally, adding the compass, an ability to record video and enabled for HSPA speed are the most obvious examples. What will be more fun to see is if DoCoMo manages to get the rights to sell the iPhone – Or – perhaps they’ll be happy with Android and, considering their long established relationship with ACCESS, a local version the new Palm Pre! As always – interesting times – stay tuned.